Use the "Snowflakes! - Don't Be Afraid" Lesson to teach your children that God is in control of everything. They don't have to be afraid because God has a plan for their lives. Decorative Items such as Flowers, Fun Foam Shapes, Buttons, etc. 2. 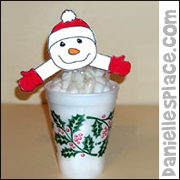 Tape the snowman patterns together, color them and glue arms onto the snowman. Tape the snowman to the wall. Tape a hat to the snowman's head. 3. Give the children hats and have them color them and decorate them. Have them write their names on the hats. 4. Play like “Pin the Tail on The Donkey” except roll up pieces of tape and tape them to the back of the hats and have your children tape the hats to the snowman. The child that gets the hat closest to the hat that is on the snowman wins. Divide the kids into teams of three or four and give them materials to make a garbage bag snowman. See which team can make the best snowman in a certain amount of time. The children can make the snowmen anyway they want. Have the children fill white garbage bags up with wrinkled up newspaper. Place them on top of each other to make a huge snowman. Use construction paper, crayons, markers, ribbon, glue, tape, etc. to decorate the snowman. 1. Before the party wrinkle up sheets of paper, flatten it out, and then wrinkle it up again into a ball shape. Tape the paper so it doesn't come apart. 2. Divide your classroom in half by placing painter's tape down the center of the room. 3. 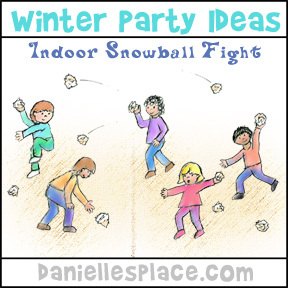 Divide the "snowballs" in half and place half on each side of the room. 4. Before the game divide the kids up into two teams and place them on either side of the room. On the word go the teams throw the snowballs across to the other team's side. After about one minute stop the play and see which team has the least amount of snowballs on their side of the room. That team is the winner. Use large cardboard boxes. Divide the children up into teams and have a relay race. Each team member takes a turn in the sled "box or piece of cardboard”. The other team members have to push or pull the person in the sled to a line marked across the room and back to the start. Another team member gets into the sled and they do the same thing. Keep playing until one team has pushed all their team mates across the room and back to the start line. 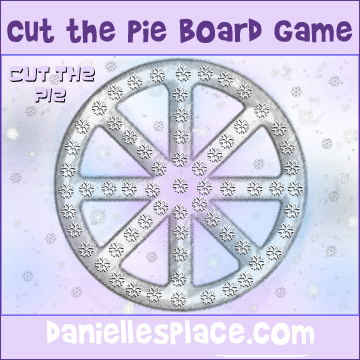 Play "Cut the Pie" if you have a big enough room or if you can play outside in the snow. To play one child is "it" and stands in the center of the circle. The other children stand around the outside of the circle. On the word "go" the child that is "it" tries to tag one of the other children. The children can only run on the circle line and the lines that go through the circle. They can't go around someone that is in front of them. When a child is tagged he becomes "it" and tries to tag someone else. You can also play this same game as a board game. Use the Cut-the-Pie Pattern from the Winter Crafts and Activities Page. Give your children markers such as buttons and let them place them on a snowflake on the game board anywhere they would like. The youngest child must place his marker on the center snowflake. To start the game the youngest child rolls a die and moves his playing piece that many snowflake spaces along the pie. He can go in any direction he wants trying to land on another players piece. The object of the game is to be the last person standing by landing on other players' pieces and removing them from the board. globe, earmuffs, jack frost, snow skis, downhill, winter scarf, bobsled, icicle, snowman, snowball, fireplace, snow, hat, sled, ice, and cold. Print out the snowflake patterns and loosely cut out the snowflakes. 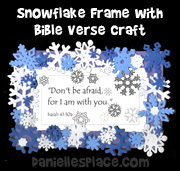 If you are using teams, print one sets of snowflakes for each team of twelve. 1. This game can be played in teams of twelve children or less or individually. 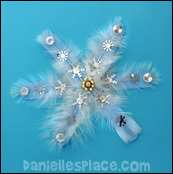 Give each team member a snowflake or give one children all twelve snowflakes. 2. Have your children take turns holding their arms straight out and dropping the snowflakes, one by one, into a bowl that is on the floor. When all the snowflakes have been dropped count how many snowflakes landed in the bowl. The team or player that gets the most snowflakes in the bowl wins. Give each child two pieces of waxed paper and let them try to slide around on the floor with waxed paper under their feet. Make snowflakes by putting paint in the children's palms. Show them how to make a snowflake by placing their hand prints on a piece of paper overlapping them slightly. See the Winter Crafts Page for directions. 1. Place one teaspoon of vanilla, one tablespoon of sugar, and 1/2 cup milk in a small Ziplock bag. 2. Place six tablespoons of rock salt and some ice in a gallon-size Ziplock bag. 3. Seal the small bag and place it in the gallon-size bag with the ice and salt. 4. Rock the bags back and forth for about five minutes to make the "snowcream". 1. 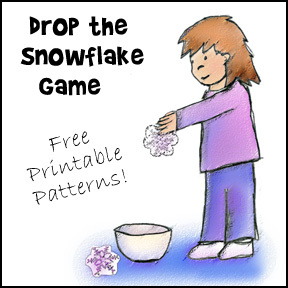 Print out the snowflake pattern onto printing paper and loosely cut the snowflakes out. 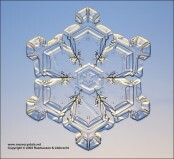 Use the free printable snowflake patterns above. 2. Mark a start line and a finish line at opposite ends of the room with painter's tape. 1. Give each child a snowflake and a straw. Line up the children on the start line. 2. On the word go they should place their snowflakes on the floor and try to blow them across the floor using their straw. They may not touch the snowflakes with their straws. The player whose snowflake reaches the finish line first wins.